This small grey or brown crustacean reaches just 2 cm long. Like other amphipods, its body is laterally compressed and elongated, making it look a bit like a miniature shrimp. Its antennae are similar in colour to the rest of its body. This beach hopper can be found in large numbers in and around sea wrack (decaying seaweed and other washed up marine matter) in the high intertidal of more protected sandy and rocky beaches, as well as in bays, estuaries, and salt marshes. Like other amphipods, Traskorchestia traskiana finds both food and shelter among wrack lines. Its range extends from the Aleutian Islands, Alaska to Baja California, Mexico. Other common beach hoppers found in the Pacific Northwest are the bright pink Maera danae, Megalorchestia californiana (distinguished by its bright red antennae and larger size), and the dull light grey Megalorchestia columbiana. T. traskiana is most likely to be confused with the latter, which can usually be distinguished by its lighter colouring and the somewhat butterfly-shaped marks on its back. ​Amphipods such as this beach hopper play a major role in breaking down algae and other detritus that washes ashore as marine wrack. 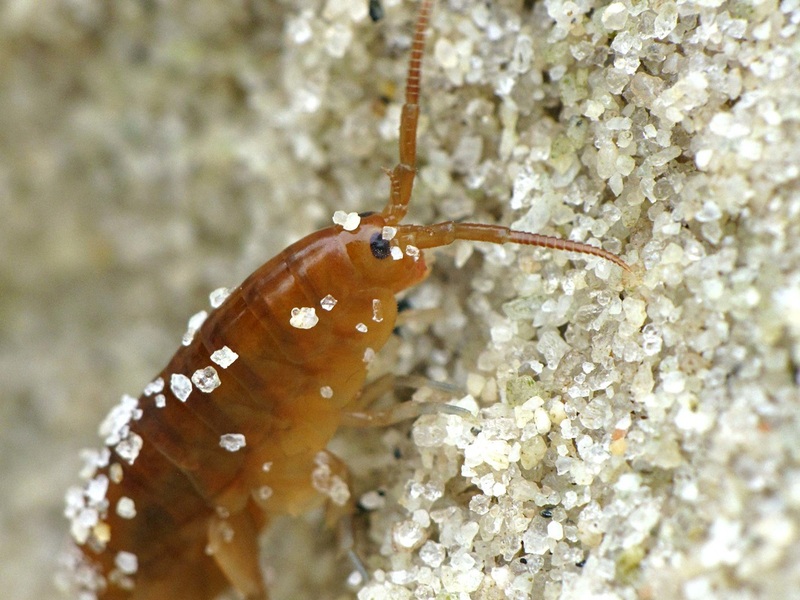 *Note that other marine amphipods are also referred to as beach hoppers, as well as sand hoppers and beach fleas (though they do not bite). Adams, M. J. (2006). Traskorchestia traskiana (Beach hopper). Intertidal Organisms EZ-ID Guides. Sound WAter Stewards. Freeland, W.A. Accessed 21/12/2015. Bartlett, K. (2008). Amphipod Care. Bamfield Marine Sciences Centre. Bamfield, BC. Sound Water Stewards. Carefoot, T. Learn About Amphipods. A Snail's Odyssey. Accessed 21/12/2015.